Hair, one of the most useless remnants of our evolution, is also one of the characteristics that gives us the most trouble. It sometimes grows in places where there is no need for it, and it won’t where you want it to. Social convention asks that everyone take care of their scalp hair, and this has such an importance in our society that we invented hair styling. This practice has existed for thousands of years, and we know that even in ancient Egypt, noble women and men not only dyed their hair, but they used hot irons to curl it and jewelry to adorn it. Moreover, having grey hair is still a bit of a taboo, and women especially are careful not to let us know when this awful event occurs. That being said, there have always been people who wanted not only to mask their graying hair, but to color it in crazy and daring nuances. In what follows we are going to talk about some of the funkiest hair color ideas and see whether they were simply fashion statements, social messages, or just fads and trends. In the 16th century, the craziest hair color ideas were that people didn’t even show their hair anymore: they wore wigs. Both men and women would sport these huge, honeycomb-like wigs, sometimes styled in the most outrageous fashion; what is strange however is that most wigs were white, whereas more daring or socially-unconventional women could wear wigs with pink, mauve or orange nuances. Mary Antoinette is renowned for her proto consumerism, and she had a special wig-maker which created for her fantasy wigs that could contain feathers, stuffed birds and flowers. On a different note, in the 21st century, people used hair color ideas in order to make social statements; the punk movement was represented by people who dyed their hair in bright, toxic colors like red, green, pink, blue, and whatever else was possible. People have always had strange hair color ideas which, combined with even stranger hairdos, resulted in truly unique looks. Today, another cultural movement which sees its representatives dye their hair in weird colors is the Anime following. Girls who love Anime dye their hair in candy-cane pink, bright green, fluorescent blue and so on. 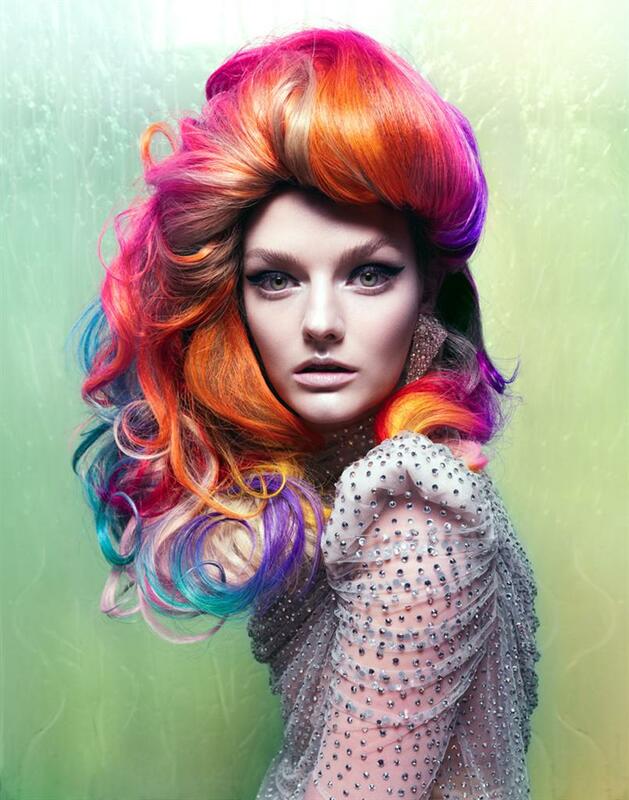 Some even go to the trouble of creating rainbow effects on their hair, and those are truly some remarkable hair color ideas when executed properly. Although we know that hair dye, no matter how organic, affects the hair by thinning it or corrupting it, people still make the sacrifice. Hair will always be an important part of who we are, and this is most evident in the fact that some people are willing to spend thousands of dollars on a hairstyle, or on a wig made from natural hair. We will always have these ideas because we love this versatile aspect of our bodies which has the miraculous power of changing who we are.